1- Heat loss. A skylight usually replaces a section of the roof or ceiling that has a higher R value than the skylight. Also make sure that the skylight shaft in the attic is well insulated. 2- Chance of water leakage through improperly flashing or counter flashing. 3- Condensation is a very common problem with skylights which can lead to damaged drywall and water stained trim or worse. The problem can be corrected by improving air circulation or installing blinds. 4- Summer overheating. The air conditioning will be working overtime unless blinds are installed. Overheating can also be reduced by choosing light reflective glass. Roof windows are more effective in controlling condensation and overheating. They can be opened and fitted with blinds and (if on pivots) cleaned from the inside. 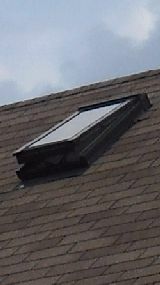 There is also a fixed skylight available which has a ventilation flap that allows fresh air in and stale air out.